Light and always accessible through the Internet, PubliAtis is a new generation publishing system that allows all the participants in your publishing chain to work in collaborative mode. Publishers generally use a group of assorted applications in order to fabricate their publications, distribute them to the public, and confirm that they have been properly delivered. 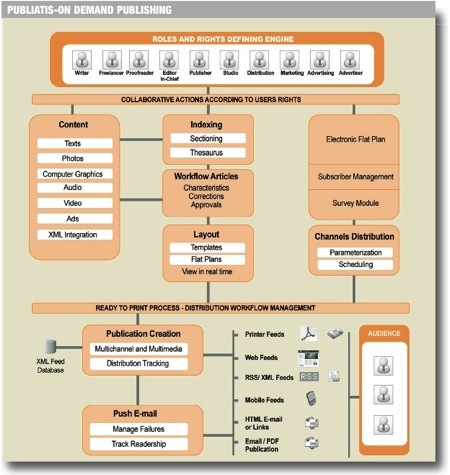 PubliAtis brings all of these functions together in one software platform, enabling both editorial managers to better control the production flow, and users to work in collaborative mode, faster and with ease. Accessible through the Internet, your publishing system is available through any computer connected to the web, 24 hours a day, 7 days a week. This continuous availability is a major benefit for publishers who employ freelancers, field reporters, or correspondents in several locations. The "virtual editorial office" is finally a reality.